Especially the machine-building industry often asks me which is the right measuring element for them. This is the reason why I want to explain in this article the differences between the most commonly used measuring resistors Pt100, Pt1000 and NTC. I will go into more detail about the lesser-used measuring elements Ni1000 and KTY sensors in the comparison at the end of this article. Resistance thermometers on the basis of Pt100, Pt1000 (positive temperature coefficient PTC) and NTC (negative temperature coefficient) are used everywhere in the industrial temperature measurement where low to medium temperatures are measured. In the process industry, the measuring elements Pt100 and Pt1000 are nearly exclusively used whereas an NTC – not least for cost reasons – is often used in the machine-building industry. Since meanwhile also the measuring elements Pt100 and Pt1000 are manufactured in thin-film technology, the platinum content could be reduced to a minimum. As a result, the price difference compared to the NTC could be reduced to such an extent that a changeover from NTC to Pt100 or Pt1000 becomes interesting for medium quantities. Particularly since platinum measuring resistors offer significant advantages over negative temperature coefficients. The platinum elements Pt100 and Pt1000 offer the advantage of meeting international standards (IEC 751 / DIN EN 60 751). Due to material- and production-specific criteria, a standardisation of semiconductor elements such as NTC is not possible. For this reason their interchange ability is limited. Further advantages of platinum elements are: better long-term stability and better behaviour over temperature cycles, a wider temperature range as well as a high measurement accuracy and linearity. 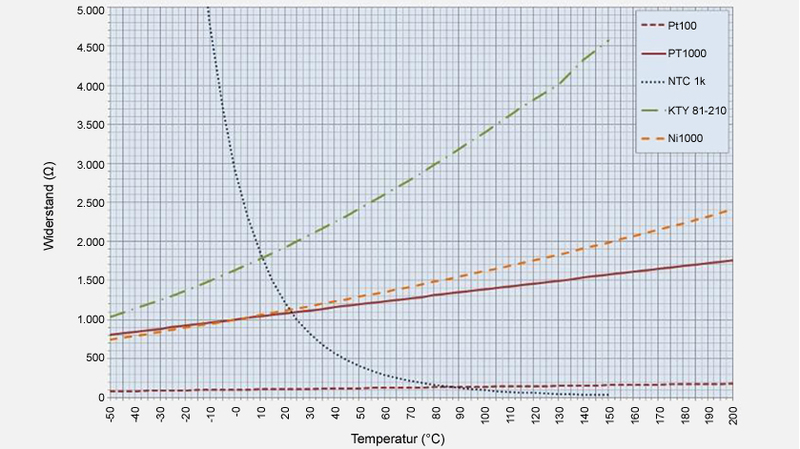 High measurement accuracy and linearity are also possible with an NTC, but only in a very limited temperature range. 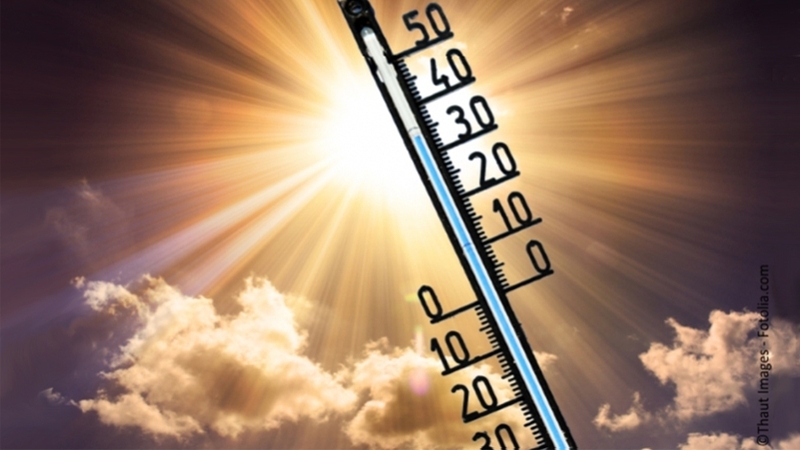 While Pt100 and Pt1000 in thin-film technology are suitable for temperatures up to 500°C, the standard NTC can be used for temperatures up to approx. 150°C. The lead resistance affects the measurement value of 2-wire temperature sensors and must be taken into account. For copper cable with a cross-section of 0.22 mm2, the following guide value applies: 0.162 Ω/m → 0.42 °C/m for Pt100. Alternatively, a version with Pt1000 can be chosen, with which the influence of the supply line (at 0.04 °C/m) is smaller by a factor of 10. The influence of the lead resistance compared to the base resistance R25 for an NTC measuring element is far less noticeable. Due to the sloping characteristic curve of the NTC, the influence at higher temperatures increases disproportionately in case of higher temperatures. I have almost 30 years of professional experience in the most diverse fields of temperature measurement. Since 2008 I have been working in the product management for Industrial Gauges and I look forward to sharing my comprehensive knowledge with you in this blog.